"It's not a question of if your hard drive will fail, but when it's going to fail." 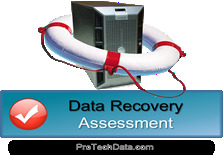 ProTech Data is experienced in salvaging important data from damaged, failed, or inaccessible media. The most common issue involves operating system (OS) failure due to physical or logical damage. Our experts will retrieve your business records and our backup service can ensure you'll never have this problem again.